Good morning everyone, I hope you are all doing well! Today I would like to tell you a little bit more about our last destination of our 3,5 weeks trip. 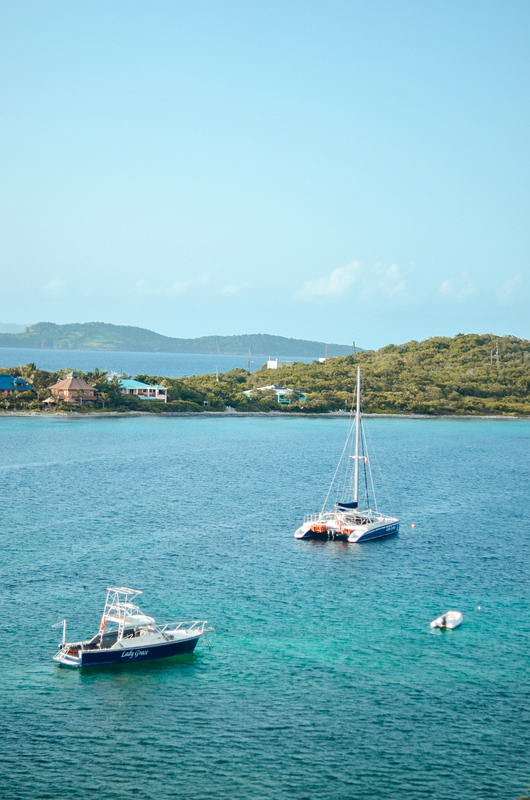 We started in New York, continued to Puerto Rico and finalized our trip in the US Virgin Islands. We chose St. Thomas as our "main island", as we decided to discover a little bit more from the US and British Virgin Islands. In this post, I would like to show you what we did on our vacation, where we stayed at and why you should visit these islands as well! Dobré ráno všem, doufám, že se všichni máte dobře! Dneska mám pro Vás (konečně) post z naší poslední destinace, kterou jsme zakončili naše 3,5 týdnové putování po USA - a to z Amerických Pananských Ostrovů. Jako náš "hlavní" ostrov jsme si vybrali St. Thomas. V tomto postu bych Vám chtěla ukázat a povyprávět něco o tom, co jsme na Amerických Panenských Ostrovech dělali, co jsme viděli a kde jsme bydleli! 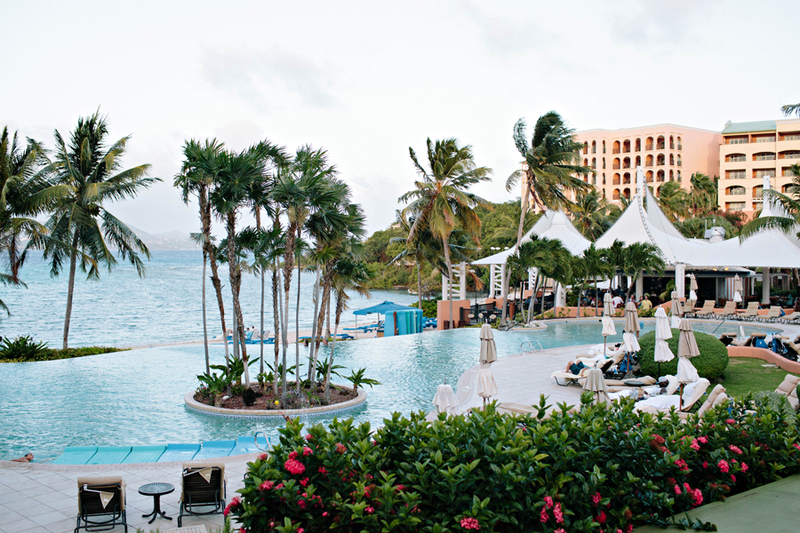 For our trip in the US Virgin Island we decided to stay with the Ritz-Carlton family and chose The Ritz-Carlton St. Thomas as our home away from home. We have been staying with the company for 3 weeks and that's why we also chose their St. Thomas location as our hotel. Their property in St. Thomas a big, luxurious resorts, which fits into the Caribbean style perfectly - their building has a beach pink-orange colour, the resort is full of palms, flowers and plants and you can also find a lot of small restaurants in the resort! Just like in New York and San Juan, also here we were booked on a "Club Lounge Room, with an Ocean View". The room wasn't extra large, however it had enough space to make you feel comfortable. We had a nice balcony, overlooking the beautiful turquoise sea, green islands with a lot of hills and the whole resort. My favourite part of our room was ordering an in-room breakfast while overlooking the beautiful nature. As you can guess from the name, our room gave us access to the Club Lounge, which is a special, spacious room, where you can enjoy several meals during the day, get a drink (or two), enjoy complimentary pressing or private check-in! The hotel has beautiful 180 guest rooms and suites, a business center and many restaurants and bars. Na Amerických Panenských Ostrovech jsme jako náš "home away from home" zvolili luxusní Ritz-Carlton St. Thomas. Již předchozí 3 týdny jsme bydleli v Ritzu a tak jsme se i v St. Thomas rozhodli zůstat věrní jedné značce. Hotel se od ostatních poněkud lišil - byl opravdu velký a kromě toho měl i krásnou karibskou barvu - růžovou. My jsme zvolili pokoj, který byl součástí Club Lounge a měl výhled na moře. Pokoj nebyl extra prostorný, ale cítili jsme se v něm pohodlně a "jako doma". Mojí nejoblíbenější částí byl velký balkon, ze kterého jsme měli výhled na moře, celý rezort a další ostrovy v okolí. Ráno jsem si vždycky objednala snídani na pokoj a užívala si atmosféry. V rámci pobytu jsme mohli naštěvovat tzv. "Club Lounge" - jedná se o speciální místnost, kde si několikrát denně můžete vychutnat to nejlepší z kuchyně, drinky, víno i jiné nápoje a další služby - například noviny zdarma, privátní check-in a check-out i zdarma vyžehlení 2 věcí denně. V hotelu si celkem můžete vybrat z 180 pokojů a suites a spousty barů a restaurací. Our first restaurant, that we got try in the resort, was Sail to Sails. 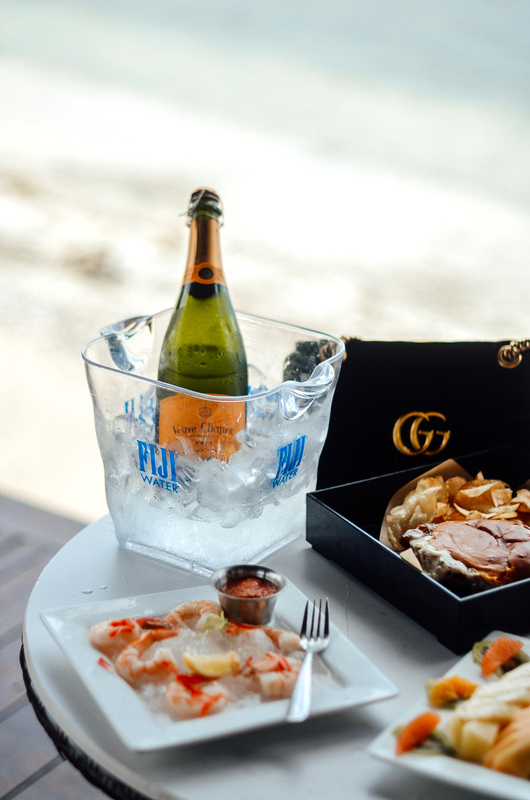 This opened, beach-side restaurant and bar is the perfect choice for a casual, fun evening. One of my favourite parts about this place was the view - from the restaurant you have a nice view over the sea and the St. John's, which looks really magical. The food was really delicious too - we got to try a special menu, which the chef prepared just for us - not only that we got to taste the best of the best, but we also got a chance to meet him personally, which was really nice too! As for the food, we started with a shrimps appetizer and continued with a lobster with a little bit of rice on the side. The best part about eating fish and sea food in the Caribbean is the freshness - the lobster tasted really amazing. The whole atmosphere, in addition with the life band playing in the Caribbean style was really amazing - we loved the evening and this definitely one of our favourite places in the whole resort! 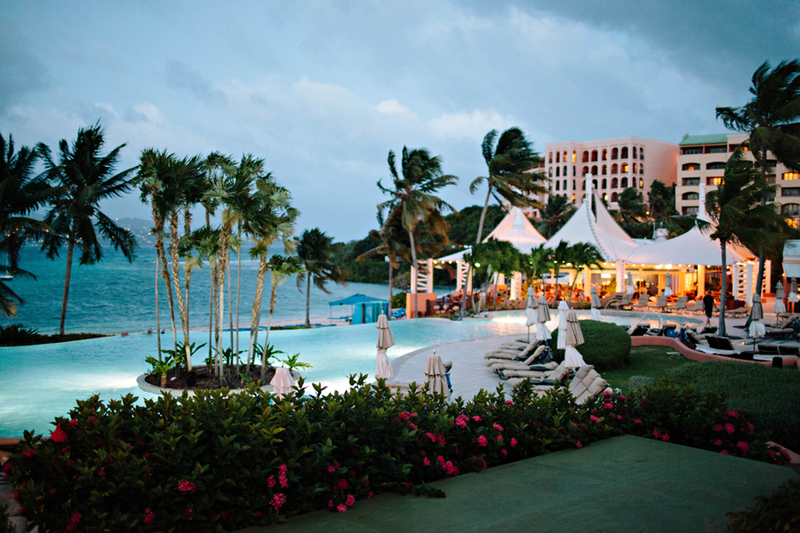 Another place, which you can find in the Ritz-Carlton St. Thomas is a romantic, Italian restaurant called Essenza. Whether it is locally sourced seafood or prosciutto from Parma, Essenza always makes sure to offer you the best of the best! What I loved a lot in this place, was the interior - Essenza had an incredible atmosphere, followed by fresh selection of pasta, pizza, meat and seafood, and of course on the menu there is a lot of Italian and international wine and handcrafted cocktails. For our dinner, I chose a Lobster Bisque to start with, followed a Risotto with sea food. I have to admit that I am not the biggest fan of risottos, however this one tasted very delicious and different. The highlight - at least for me - was the dessert and the wine. I love coconut ice-cream, so being able to eat 3 scoops after the dinner, was really "my kind of thing". Also, the rosé, which we had, was really good - so good we even had to take a picture and look for it here, back at home in Europe! Another place we got to try was the Bleuwater, which is a island chic, sophisticated restaurant serving local seafood creations, a lot of meat-meals and they can be proud of their award-winning wine selection on their menu. We also did a private dining on the beach, and we also chose Bleuwater as the menu. I got to try their amazing lobster and also a lot of other sea-food dishes. The restaurant was an inside and outside part, so each and everyone will find what he likes! První restauraci, kterou jsme měli tu šanci vyzkoušet, bylo Sail to Sails. Jedná se o otevřenou restauraci postavenou přímo u pláže. V Sail to Sails si kromě čerstvého, výborného jídla, můžete vychutnat i krásný pohled na celou pláž, moře i další ostrovy - například St. John's. Pro mě bylo Sail to Sails skvělým zážitkem - restaurace má neuvěřitelnou atmosféru, takže proto se stala mojí nejoblíbenější restauraci v celem hotelu. Dále jsme měli tu možnost vyzkoušet i italskou Essenza, ktera nabízí klasická italská jidla, včetně pizzy, těstovin, salátů, masa i ryb. Samozřejmě na menu nechybí ani spousta italských vín, koktejlů a jiných nápojů. Essenza mi přišla kouzelná svým interioŕem, který byl romantický a moderní zároveň. Poslední restauarací, kterou jsme vyzkoušeli, je Bleuwater - menší, útulnou restauraci, která se specializuje na čerstvé, lokální speciality z ryb a mořských plodů. Ma menu najdete ale take spoustu pokrmů z masa, zeleniny a mezinárodní kuchyně! In the hotel you can find 2 pools - you can relax in the amazing jacuzzi or take swim in their infinity pool, overlooking the island St. John's and other smaller islands. 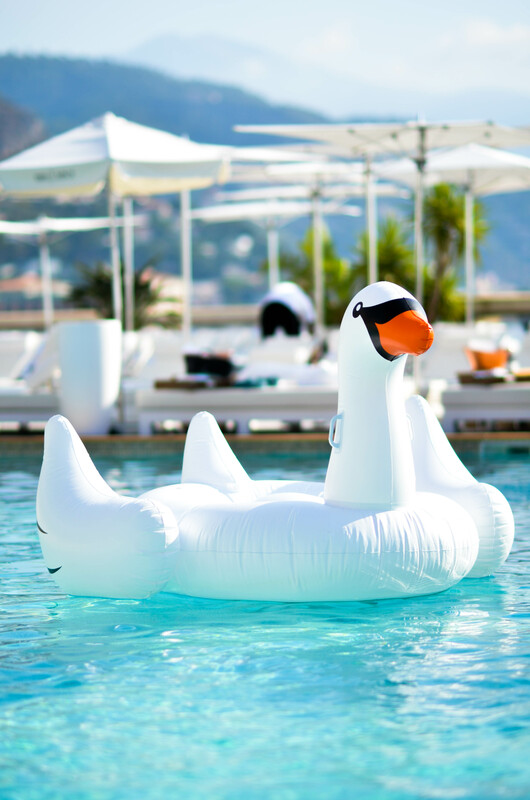 Of course, you can choose a sear at the pool, at the beach or also reserve a private cabana, which is an another level of comfort - the Cabana comes with 2 seats and 2 beds inside, and also 2 outside. You have a lot of space, where you can put your items, however also a lot of space to relax at - plus, there is even a TV! In addition, the lovely staff makes sure that you have everything and brings you Mimosas right to you! I chose this place as I also wanted to work a little bit on the beach and I am really happy I did so - the Cabana was great! In the resort, you can also visit their spa and get one of their treatments. As a part of the hotel, there are also a lot of boats, which you can rent (with a captain) and enjoy several experiences. 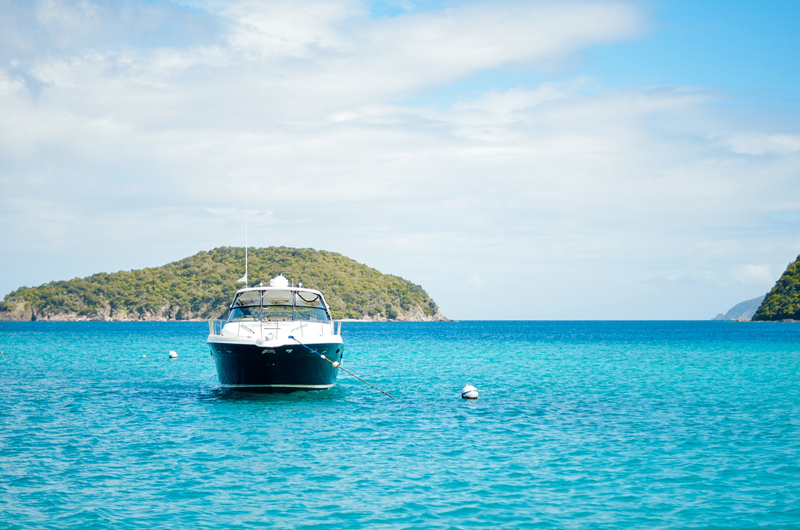 On our first day we decided to book a private boat, which allowed us to discover other islands, which belong to the US Virgin Islands, and also some, which you can find in the British Virgin Islands. 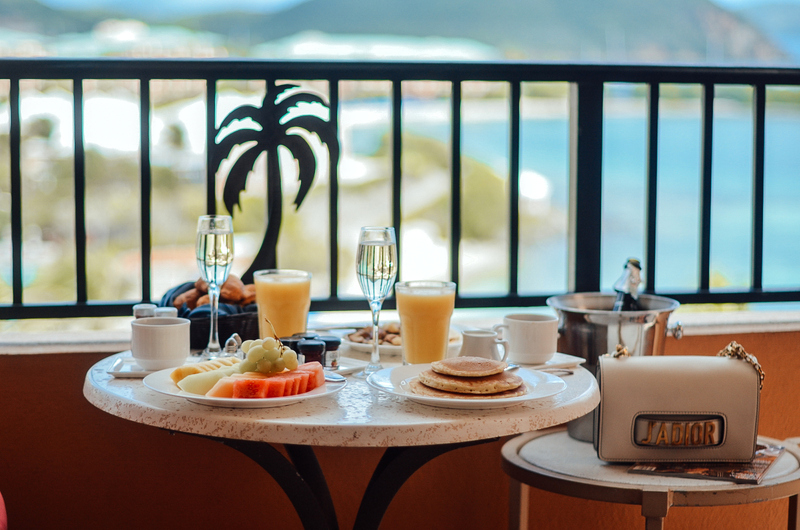 We both, meaning me and my boyfriend, enjoy going on a water with boats, so this was definitely the right thing to do for us - we started by having a big breakfast by the St. John's and then continued to smaller islands and also to Jost Van Dyke, which was amazing. The island hopping is something, which I recommend to anyone - it's a true experience! In case you don't want to go on a "full day" trip, you can also book an evening trip with the boat to St. John's. On the boat you can get some cocktails, drinks and small bites while enjoying the sunset on the open water. 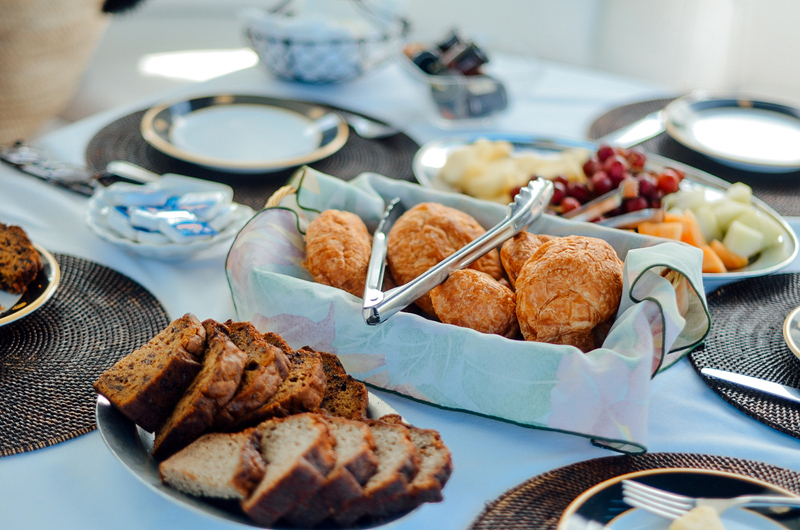 In the island, you have a free time about 3 hours and then the Ritz-Carlton team will take you back. I think this is something "different", which you definitely need to try. In the hotel, you can also other activities - like enjoy their water-sports, discover their new bar, or simply relax on the beach. St. Thomas was a completely different than I have seen before and if you get the chance, definitely make a stop there (it's really worth it!). Hotelový areál má celkem 2 bazény a take jacuzzi. Jeden z bazénů je infinity pool, ve kterém můžete relaxovat a zároveň si užívat krásného výhledu na moře a ostrov St. John's. Lehátko si můžete vybrat jak u bazénu, tak na pláži - pokud ale chcete mít maximálního soukromí, určitě si zarezervujte "Cabanu", která je úplně oddělená od ostatních lehátek. Patří k ní 2 lehátka na sluníčku, 2 lehátka ve stínu a také stůl s židlemi, menší křeslo a také televize. Jelikož jsem na pláži často pracovala, Cabanu jsem využívala celkem často - je pohodlnější, soukromnější a klidnější. V Cabaně máte také svého "osobního" číšníka, který se o Vás postará a přinese Vám to, na co si vzpomenete! V hotelu najdete také hotelové spa a Ritz také nabízí spoustu výletů - my jsme si hned první den pronajali loď, díky které jsme poznali více ostrovů, které patří k Americkým Panenským Ostrovům, ale také ostrovy Britských Panenských ostrovů. Já osobně mám lodě a vodu moc ráda, takže tenhle výhlet byl trefou do černého. Začali jsme snídaní u St. John's a pokračovali k Britským Panenským Ostrovům, kde jsme se vykoupali, podívali se na ostrov Jost Van Dyke, a také šnorchlovali. Tohle byl pro mě highlightem celého pobytu - celý výlet jsem si moc užila, a "island-hopping" doporučuji každému, kdo se na Americké nebo Britské Panenské Ostrovy chystá! Celkově se mi na ostrovech, které patří k Americe a Británii, moc líbilo a určitě bych se na obě místa jela podívat ještě jednou! Also, I would like to dedicate this post to everyone, who got affected by the latest hurricane Irma. The storm has destroyed several islands in the Caribbean, including the beautiful St. Marten and St. Thomas. I hope everyone is safe - I am sending big support to everyone, who is affected by this event. I love your photos! Looks like you had a wonderful time, filled with delicious food! The photos look so beautiful! So sad that the island got destroyed by the hurricane.